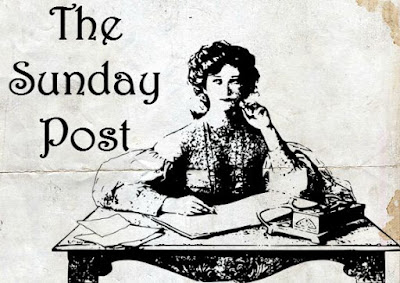 The Sunday Post is hosted by The Caffeinated Book Reviewer. It’s a chance to recap the past week, talk about next week, and share news. 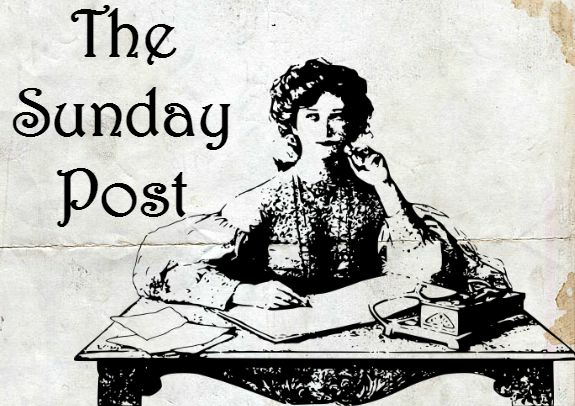 It’s Monday, What Are You Reading? is hosted by Book Date. I get to tell you what I’ve read recently. I hope your Thanksgiving was great (again)! On Monday I reviewed State of Wonder by Ann Patchett. On Wednesday I reviewed Touching the Void: The Harrowing First-Person Account of One Man’s Miraculous Survival by Joe Simpson. On Monday I review The Stranger in the Woods: The Extraordinary Story of the Last True Hermit by Michael Finkel. On Tuesday I show you my Newbery TBR. On Wednesday I review The Edible Woman by Margaret Atwood. On Thursday I catch up on some tags. I’m still participating in the Tome Topple Readathon. That means I’m only reading huge books for the rest of November. 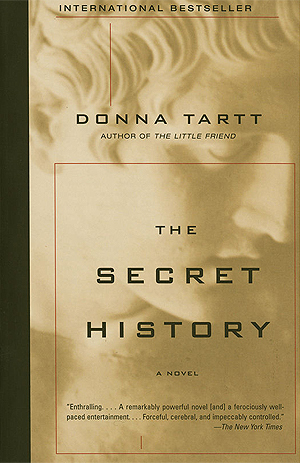 Last week, I finished The Secret History by Donna Tartt. Right now, I’m reading A Game of Thrones by George RR Martin. I ate so many different kinds of pie. I ran out of books to read, and I may have gone overboard with refilling my TBR shelf. Oops. I had time to take photos. Can't wait to see what you think of The Secret History. Yay for Thanksgiving and pies. Have a great week! I unfortunately had the flu. It happens every year that I get a flu shot that I get the flu. I was in bed with audiobooks keeping me company all weekend. I look forward to your tags. "Ran out of books to read." Is that a thing? Seems impossible. Oh, I do love pie...and there were many kinds from which to choose at the dinner on Thursday...but, since it was at my daughter's in-laws' home, I tried to behave and choose only one. LOL. Enjoy your week, and I keep thinking I've read The Edible Woman...but according to what I've entered on Goodreads, I have not. Hmm. Happy Thanksgiving!! I'm glad your pie was great! Haha! I've never met a pie I didn't love. And wow! Congrats on getting on top of your Christmas shopping! I'm pretty far behind this year... Have a great week! I'm glad you had a nice Thanksgiving. You're already done with your Christmas shopping? Wow.. I haven't even started yet. Yikes. I had to laugh at your turkey Trump. I wish I could be the kind of person who gets done with Christmas shopping early. :) It never seems to happen lol. And happy Thanksgiving!! Lots of pie is good! Yay for Game of Thrones. Happy Thanksgiving! Pie is always a good thing! Have a great week! I've had a slice of pie every day since Thanksgiving..lol Glad you had a good one! You are so ahead of the game. I've barely got any shopping done. Luckily, I don't have too many to buy for. And I adore pie. Any kind of pie! Ran out of books to read? Horrors!! 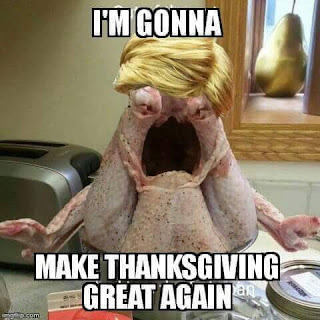 I'm pretty sure that Trump Turkey just made me loose my appetite XD. I really hope you enjoyed your thanksgiving. And yeah, I had some Pumpkin pie left-overs at my house too. Have a great week! "I ran out of books to read" <-- things I will never be heard saying. 😂 I think my books have filed a formal complaint of neglect, because I keep reading the new ones first and checking out books from the library. I really admire that you have accomplished reading all your books. Gold star for you! Finished shopping??? HAHAHAHAHHAHAHA I haven't even made a list yet. No pie at my house! ;-) We didn't actually have a dessert at Thanksgiving. I should make one for this week. Come see my week here. Have a great week! Ha, I love the photo!! And I think its great you buy for dogs(yours and others). I have one whole pie left!! Have a great week!! We didn't have any pie. Come see what I'm reading this last week of November. Love the picture! *giggles* Ooh hope you're enjoying A Game of Thrones! Tome topple sounds like it would throw my reading stats for the year!!! Ha ha. I do love ASOIAF though! I hope you had a great Thanksgiving and I am guessing you did based on the pie comment :) Don't tell my dogs that other dogs get gifts for the holidays because it is not happening here! Have a great week! Oh I totally shop for dogs for Christmas!! Glad you had a nice Thanksgiving. And that Trump turkey meme is TOO FUNNY!! !